Ginnys Wigs in Gastonia, NC is located only 20 minutes from Charlotte. Ginny's carries a full selection of womans, mens and childrens wigs, including Estetica, Tony Of Beverly, Henry Margu, Aspen and many others! 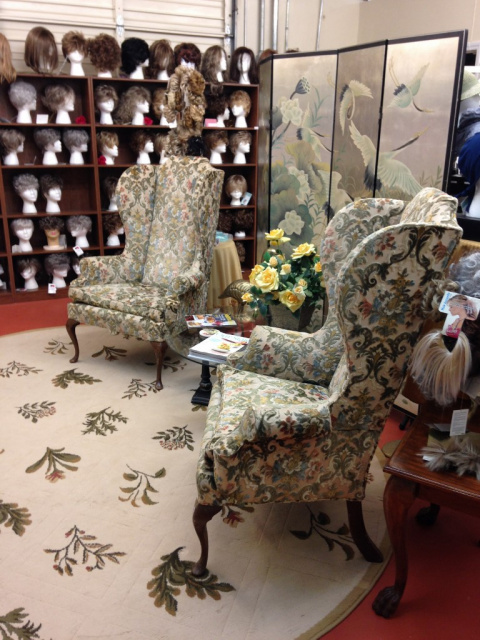 Ginny's Wigs is located in Gastonia, NC and is only 20 minutes from Charlotte. Ginny's Wigs has over 1,000 wigs in stock available for purchase, and offers a unique wig shopping experience. Ginny's carries a full selection of wigs, including Estetica, Envy, Tony Of Beverly, Henry Margu & Aspen. Selections include wigs for hair loss, fashion, or style change. Follow us on Instagram, the link is below! Ginny's Wigs will be closed on Friday April 19 and Sat. April 20th. We will reopen Tues April 23. We are usually closed the Sat before or after a holiday, so please call ahead to confirm our hours. Occasionally we close for a few days during holiday weekends. Please click on the Facebook logo and LIKE US on Facebook. During our normal business hours, please arrive at least one hour prior to closing so we have sufficient time to assist you with your wig selection. Please arrive by 4:00 Tues to Thurs, and arrive by 2:00 on Friday and Saturday. If you are uncertain, please call ahead as we may close early. . The Hair Grip is now available at Ginny's Wigs. Click for more information. 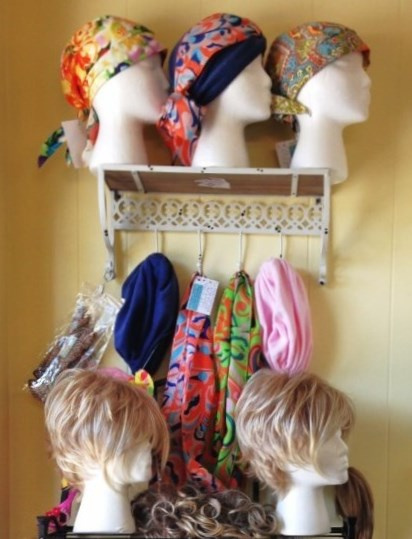 Ginny's Wigs carries a full line of scarves, head wraps, cotton caps, turbans, accessories and hats. Ginny's Wig Salon in Gastonia, NC, is a professional retail salon and boutique that includes online browsing and professional wig salon services. With a selection of over 800 wigs, the choices are endless! A personal visit works best, but wigs can be viewed online for reference purposes, and purchased or ordered at Ginny's Salon. Ginny and the experienced staff at Ginny's Wig Salon in Gastonia will personally assist you with the proper wig selection. Relax in a peaceful atmosphere with private rooms for personal comfort, and professional service by an experienced hairdresser. Ginny has many years experience with clients receiving chemotherapy treatments, as well as clients with alopecia and thinning hair. Her understanding of a clients needs is based on her own personal experience with an illness that caused severe hair loss. She understands the needs of clients purchasing wigs for acting, stage and drama performances, as well as clients who want some fun in their everyday life. Ginny stocks a full selection of jewelry, head wraps, hair scrunchies, clip on hair extensions and more!. If you are interested in any of the wigs online, email: ginnyswigs@yahoo.com. Please include some information about your lifestyle, color choice, length and style of any wig you are interested in, Ginny will do the rest! Ginny's Wigs has beautiful wigs in stock in every color, style and length. Wigs with natural beachy waves, soft, wispy layers, and smooth clean lines, all in stock available for purchase. 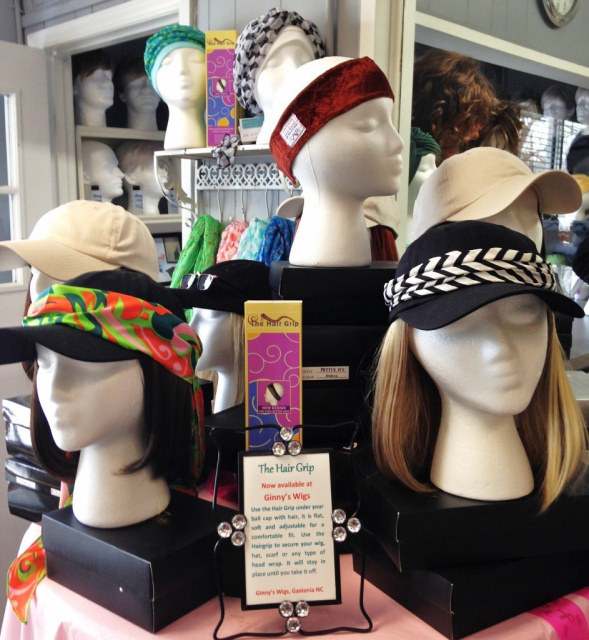 New styles of head wear are in stock at Ginny's Wigs, and as always, Ginny's carries wig care products and accessories.